The one rupee note will be back after 22 years. The government today said the smallest denomination note is printed and ready for release soon. 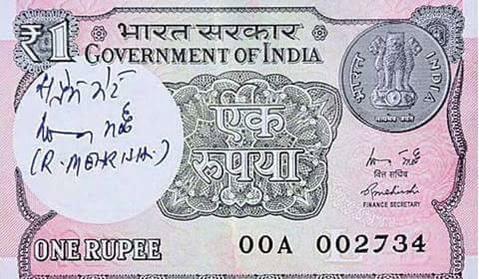 The Re 1 note was discontinued in 1994. The next year, Rs. 2 and Rs. 5 notes were also pulled out to free printing facilities for higher denomination notes. The old notes are still in circulation and remain legal. The new notes will bear the bilingual signature of economic affairs secretary Shaktikanta Das. The numbering will be in the black at the right-hand bottom portion of the note. On the reverse side, the year '2017' is mentioned. There is also a representation of One Rupee coin with rupee symbol having a floral design and the surrounding design consists of the picture of 'Sagar Samrat' the oil exploration platform. "The color of One Rupee Currency Note shall be predominantly pink green on the obverse and reverse in combination with others," the RBI said.